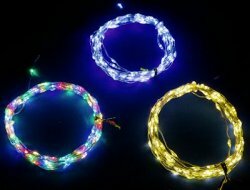 This new LED string of lights uses the very small Nano size 0804 mm SMD chip LED. There are a total of 100 LEDs spaced approximately 1.25 inches apart and wired with either a copper wire or a silver wire. The total length is over 10 feet of lights. 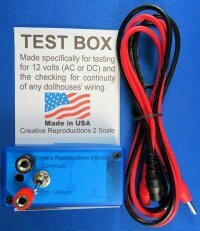 It will run on a AA battery box or the 12 volts DC current of the doll house when connected to a special adaptor. It is not wired to work on AC. This unique string of lights is available in all pure white, warm white or multi-colored strings. 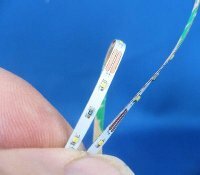 Because they are made with LEDs, they will last for over 50,000 hours of continuous use and draw only 390 ma. of power. The string can be cut at any length. If used with the 12 volt adapter one can connect up to three strings to the one adapter.